Fedoskino, Palekh, Mstera and Kholui are known to connoisseurs around the world for their inimitable lacquer miniatures. Deeply rooted in history, this art form, along with traditional folk art, icon-painting, and the secular paintings of the mid-18th to late 19th centuries, is among the most splendid and distinctive of Russia’s artistic achievements. The art of Russian lacquer miniatures became famous all over the world owing to the activities of the four old handicraft-centers: Fedoskino, where in the first half of the 19th century the workshops of the Vishnyakov family and Lukutin’s factory expanded large –scale production, exploiting both the Oriental and Western European tradition of lacquer miniatures, and the ancient icon-making centers- Palekh, Mstera, and Kholui, where lacquer miniature painting as an art industry came into being, so to say, “through force of circumstances”, for in the 1920’s highly qualified icon-painters were compelled to seek some other field for application of their talents. Nevertheless, those difficulties didn’t prevent the icon-painters from achieving the greatest heights in the creative field that was new to them. Russian lacquer boxes can exist in any kind of space without destroying the environment around them. When we handle such a small, daintily painted bagatelle, we not only enjoy it esthetically, but also receive from it spiritual and intellectual nourishment, learn something new, absorb that life-giving energy, any artifact created by a talented master is brim-full of. Browse through our gallery of over 250 different boxes painted by some of the most exclusive Russian artists. All boxes are 100% hand painted and hand made. Russian lacquer boxes make great gifts for any occasion and are a wonderful collectors items for anyone who is into art! 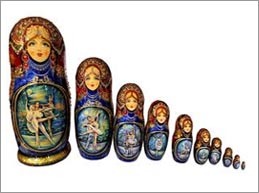 The word Matryoshka is related to the Russian word mat’, meaning “mother.” The symbolism is obvious, as each doll has one daughter inside, and then another. The nesting dolls are also sometimes spelled Matrioshka, Matreshka, Matushka or Babushka Dolls. Regardless of the spelling this unique form of Russian art is very popular and is a symbol of Russia and Russian culture. Russian Matryoshka dolls first appeared in 1899 in the city of Sergiev Posad, about 50 kilometers north of Moscow and are known greatly available throughout Russia and many other parts of the world. Amber working is a field of artistic craftsmanship comparatively little known, not only to the average tourist vesting the famous museums of Europe, but also to many experts more closely involved with this craft. 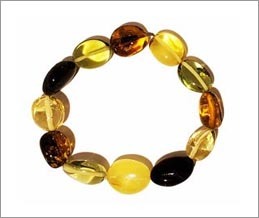 Thanks to the special qualities of the material, closely connected in general with the region of the Baltic Sea Basin, artifacts made of amber have distinctive and unique features. And though amber relics can be found today in many world-famous collections, its place of origin is quite closely limited to a few historical centers concentrated in the Baltic region. 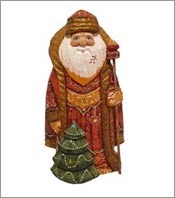 Russian Wooden Santas are some of the most desirable and collectible Santas in the world. Each Santa is typically made out of solid wood, typically Oak because of its abundance in Russia and also the hardness of the wood. After the Santas are carved by hand, they undergo an intensive process of painting and polishing. Painting the Santas is very hard work because they are painted on a non-flat surface and they vary in size, some getting very large. Russian Santas known as "Ded-Moroz" or Father Frost have been made for many years, they are beautiful, and very collectible. The Russian Wooden Santas typically vary in themes, some have winter themes like The Snow Maiden, Children receiving gifts and presents, Snowmen, etc. Others carry religious themes, such as Angels and Nativities. All of our Russian Wooden Santas are made entirely by hand, first hand carved, then hand painted. Some of the artists who paint these Santas are very famous and sought for. We typically wait up to a year to receive some of the famous artists pieces. One of these artist is Marina Nadejdina. 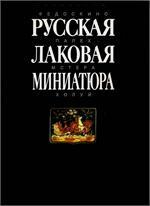 Her work is very well known not only in Russia but in most parts of the world. Her Santas are very collectible and desirable, not to mention beautiful. The Russian icon enjoys universal recognition in the world of art. It’s spiritual charge and the artistic beauty – paradoxically close to the finest examples of contemporary art- attract the attention not only of amateurs but of all those seeking through art a means of elevating the spirit and promoting a moral renewal. In addition, a striking aspect peculiar to the Russian icon is its fascinating mysterious quality. The technique and symbolism of color generate questions which may be fully answered only by viewing the icon not solely as an object of aesthetic admiration but also as an element of ecclesiastical and religious life. Browse through our large variety of Antique Russian Icons and find a vast collection of various themes including themes such as: Christ the Pantocrator, Various Mother of God Icons, Nativity's, Entry to Jerusalem, Scenes from Christ's life and many more!